Book Ferries to England, France & the Channel Islands with Condor Ferries - Cherbourg, Portsmouth, Guernsey, Jersey, St Malo and More! You can use AFerry to book a Condor ferry to the Channel Islands, France and England. Condor Ferries is the only company that provides a car ferry service to the Channel Islands from mainland UK. Their modern ferries offer the highest levels of comfort and a wide range of on board facilities. AFerry always has the latest special offers and deals for Condor Ferries. You can use AFerry to book Condor Ferries to Cherbourg, Portsmouth, Guernsey, Jersey, Poole, St Malo and Weymouth. See below for the latest Condor Ferries prices and sailing times. Click on your ferry route for a detailed Condor Ferries timetable. When do they sail? Usually from April to October. When do they sail? Usually from May to September. When do they sail? All year round sailings, however, there are increased sailings in the summer. 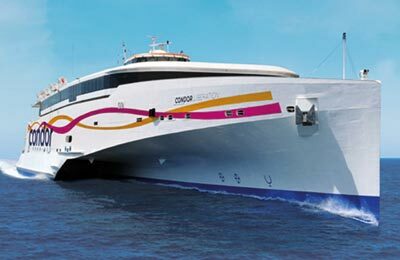 Condor Ferries operates a modern, well-equipped fleet including conventional and fast-craft ferries. All Condor Ferries ships have a range of bars and dining areas. On their fast crafts you will find a choice of self service cafe outlets and snack bars. On their conventional ferries you will also find a sit down restaurant. 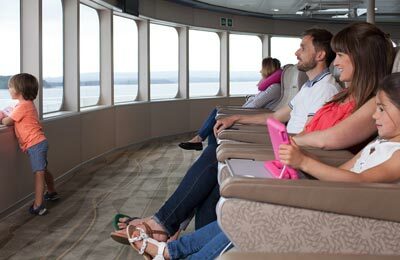 You will also find shops on board their ferries and the option to choose luxury reclining seats. You can also book comfortable cabins on the ship the Commodore Clipper which sails between the UK and France and on inter-island routes. There are two, three or four bed cabins available fo you to book and all offer ensuite facilities. 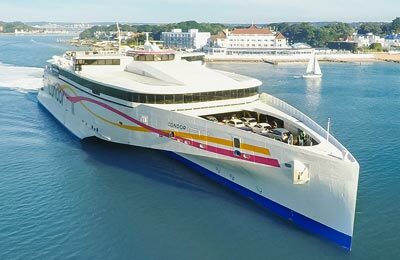 Whether you book the Condor Ferries Portsmouth Cherbourg route, the Condor Ferries Guernsey Jersey service, the Condor Ferries Weymouth Jersey line or any other Condor Ferries route, you are bound to have a relaxing and pleasant experience. Book your Condor ferry with AFerry. The booking in and loading was very efficient. The staff were friendly and helpful. The evening meal was good value. I had a reclining seat ticket which was enough to get some sleep during the crossing. Delays due to weather are obviously beyond the control of Condor ferries. I recommend this route and would use it again. Comfortable journey. A bit on the long side. Overall a good service. Food a bit to expencive,and some duty free not much of a bargain.